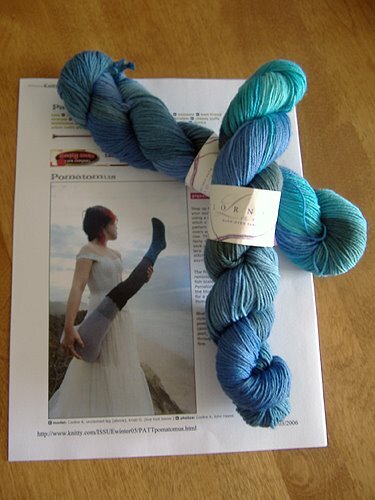 I feel like I should be singing that song every day now as I wait anxiously for my “Green Gable” yarn to arrive. I thought I might actually be participating in a KAL at the same time as everyone else but alas… . The good news? My “Pomatomus” yarn is all wound, just waiting to be cast on and off I go. The colourway looks really pretty in the ball – more like how it will look in the pattern I think, so looking forward to that as soon as I finish this update. I did pick up some lovely handpainted sock yarn on Ebay in a very unique colourway – I think I may be brave and try my own pattern on this (pics to follow – with thanks to DD). Must go and cast on poms – can’t wait to get my hands on that Lorna’s Laces!